Celebrate National Lipstick Day with a great offer from Lancome! Get a Free full-sized Juicy Shaker ($29 value) with orders of $50 or more! Friday's shade is Piece of Cake, Saturday is Great Fruit and Sunday is Apri-Cute. Offer is valid July 28-30, 2017. Limit 1 free lipstick allowed per order. 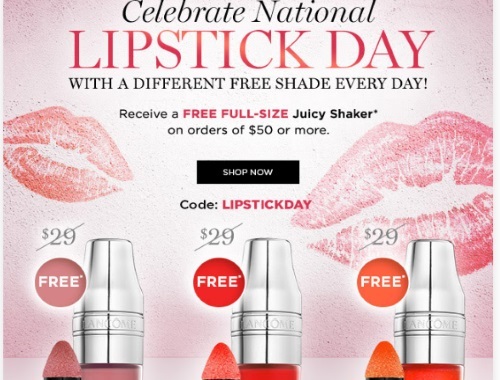 Enter the promo code LIPSTICKDAY at checkout. There is a different free shade every day during the promotion. Click here to browse Lancome.